I keep a list of requests from people and ideas of my own in a list and once recovered from a development / test / release / support cycle sit down and try to sort them into some sort of priority order. Those who've been with this project from the beginning will know it's a means to an end for me, not commercial, although it would be nice to be able to spend more time on it, which if I could figure out how to support the family from just this it would be awesome! Having my own score editor for me is just to be able to work on progressing the experiment of software being able to "listen" to drumming and write most of the score down for you. There's been lots of press around a tablet advert recently where it showed someone scribbling notes and it interpreting them for you. That's all about finding a more natural way to enter the score into the system, and handwriting is still easier for most than flying a keyboard and mouse. I say most as my handwriting is now awful after 30 years as a keyboard warrior! I'd say for drummers the most natural way to enter a score would be to simply play it. Why has nobody ever done this before? The answer is it's complex but is achievable, and the only reason is the amount of effort (the hundreds of days of coding) to do it would never be recovered financially, so the effort can't be made to make it happen. We're not that funny a lot in pipe bands, it's our hobby and we spend enough on uniform, travel, subs etc to play in a band, so paying a couple of hundred pounds for a software tool that will help save some time in writing out scores isn't really a priority for most! And it would be that price if I had to pay others to write the software, couple of good developers for a year would cost 100K, if each copy were to sell at 200 pounds, that's 500 copies needing to be sold before breaking even - if anyone would pay that for it! There's not 500 people needing that level of sophistication. So this will continue as my ultimate goal, to get a piece of scoring software good enough to be usable everywhere, and use it as the mule to carry the scores created by the "listening" software. Does it exist? Yes, but only in very formative terms, experimental even. It can cope with a simple 2/4 time sig and very simple note structures, go irregular group and it hasn't got the nouse to reverse that into a series of accurate notes yet. But it will, when I get time to work on it further. That's probably achievable by this time next year! I'm also starting to write a new app for the iPad / iPhone for editing drumscores. I'm not convinced myself, I think the usefulness is limited, compared to a laptop with keyboard and mouse and listening to scores with the inbuilt microphone is potentially limited too, am hoping there's more of a convergence between laptops and tablets ultimately but definitely requires a complete new app to work in the Apple system properly. Then it needs writing again for the Microsoft world. So if there's any billionaire out there who wants to make a large payment so I can go work on this full time for reasons of simple philanthropy please call ... soon! Drum Score Editor version 2.22 is here! This is a minor release that adds one new feature and fixes bugs identified in the 2.2 release. Music and Text components on a page are now locked from editing by default. To enable editing use Edit -> Page in the same way you'd unlock bars or notes for editing. Tenor Reverse Left & Rights were ... well, reversed! Drum Score Editor version 2.2 is here! All the symbols as specified by the EUSPBA can now be placed on a score. This includes regimental and traditional piano movements which are created by selecting the notes / rests over which they are to be executed and using the toolbox buttons on the right. It is well understood that there are many variations of tenor symbols, with no complete standard in use anywhere, the EUSPBA symbols are the only documented standard found to date but even they are not a complete list. Given the infinite number of possibilities of markings and symbols, some of which are only understood by sometimes a single corps, a more complete strategy for musical notation for tenors is needed. Notes and rests can now be marked as double dot in length. This is achieved by selecting the note and using shift and the dot key together, i.e. shift-. There is no button in the toolbox for this. Drum Score Editor now implements a "what you see is what you get" approach more fully. If a paper size of A4 is specified, the size on the screen is the correct physical size of the paper. This is dependent on the graphics card on your system accurately reporting it's dimensions and dots per inch - I expect there will be some setups where this won't hold, in which case using the zoom function on the toolbar manually will be required. 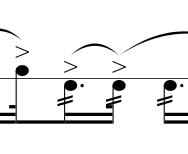 As of this release, Drum Score Editor will draw ties between notes which are not marked as being for an irregular group underneath where accent markers are drawn. Such ties (sometimes called binds or slurs) are usually to indicate a roll movement. To override this behaviour and revert to the prior approach of all ties being drawn above the accent markers, set the score properties options to uncheck the setting. When the File -> Save As ... menu item is used, if you provide a filename that doesn't end with .ds, Drum Score Editor will automatically add it. If it adds a .ds suffix and detects that a file with that name already exists and would therefore be overwritten if it continued to save, it reprompts you provide the filename, suggesting the newly suffixed filename. This is so you then get a chance to actually explicitly say you want to overwrite that file. This is a new feature available to licensed users only. It allows you to set the options that Drum Score Editor will use when generating new scores, e.g. type of note head to use, where to draw roll ties, the author name, band name, highlight colours to use etc. Recently received a great suggestion to reverse current placement of tie start and end points versus accents, i.e. so accents sit above the start of ties. been thinking this through and am sharing my thoughts here on how that could be implemented. Looking for feedback / comments before I start spending a bunch of time coding it up. Revisiting the initial thinking which placed them this way round, the snippet below is the problem I was trying to address, resulting in what originally seemed to be a good compromise in terms of clarity and cleanliness of the score. If we put the ties closer to the head how will this work? Note the last left hand flam at the end of the 2nd triplet. The tie would cut through the flam grace note. Maybe the right design is to have the option to mark a “low" start for tie on a note, with the default remaining a “high” start point. Will have to tweak where the tie starts relative to the note head too, today a tie starts and finishes above the middle of a note head, it may be cleaner to have the tie start toward the end of the opening note and toward the start of the closing note. Another option might be for Drum Score to automatically work things out, saving the author having to think about it thus increasing productivity. Maybe we place the tie end higher if it needs to, i.e. if there’s a flam grace note. That would be a big (maybe welcome?) change in appearance for existing scores though, as we’d be effectively changing the default to a low start. One approach could be to introduce a global option for the score to place tie ends below accents. Then have the option to manually raise them to a high end point if need be, or once again, automatically do it, in the case of the flam. Think I prefer something more automated. Introduce logic, activated if low start and end of ties has been chosen, that puts the end points high again, if a grace note such as a flam is on the closing note, avoiding the situation where the tie line would cut through the grace note. At a later date, as nobody has actually asked for it yet but I've see it in a number of scores over the years, is to have an option where irregular group ties are placed underneath the note group, ie. triplets etc appearing below the group of notes with a horizontal line bracketing the grouped notes. e.g. —3 — appearing below the notes. Drum Score Editor version 2.11 is here! Text can be attached to each note, rest or bar line (i.e. any element) on a staff. Select the element that is to have the text attached to it and use ctrl-t to add or delete the text entry. The advantage of text tags over the current ability to add text areas anywhere on the page is that they stay aligned with the element they're attached to. This means when an additional staff line is added or removed, the text tag moves with the note, rest or bar line it's attached to. Similarly if you move that element along the staff line, cut, copy or paste it, the text moves with it. A text tag can be aligned around the element it's attached to. By clicking inside the text tag and using the Format -> Text menu, all the text formatting options can be applied. By selecting Align Left, the text tag starts with the first character above the element. Selecting Align Right causes the text tag to finish above the element. Align Centre does as expected, with the text tag centred over the element. The text is styled using the same menu options, once again click inside the text tag and use the Format -> Text menu options to apply bold, italic or underline styling, change the font between serif or sans-serif, and alter the point size between the pre-selected sizes. The last option is to be able to position the text either above or below the element it's attached to. Click inside the text tag and use the Alt and UP or DOWN arrow together to move it above or below. Currently the distance above or below the staff line is fixed, but the capability is in the software to add actions to customize the distance in future versions. One of the navigation features requested by power users was to have a key sequence that skipped the cursor in a music area to the next bar. While editing a music area, the space bar can now be used to move to the next bar line. The cursor is placed at the start of the first note in the next bar, if the next bar is empty it's placed at the very start of the bar. This means that when the next bar line is the last one on the line, and the next line has space for an anacrusis which isn't used, the cursor stays on the bar line at the end of that line. If there is an anacrusis, the cursor is placed at the start of it's first note. A note's duration can be halved or doubled using this new feature. Select the note and use shift-n to half it's duration, shift-m to increase it. The value in this feature is that once a note has been entered on the staff line, maybe had grace notes added, back beaming set as required, text tags added and eventually it's realised the note should have been a demisemiquaver instead of a semiquaver this can now be changed without having to delete the note, insert the correct one and start the process of adding the grace notes etc again. For the technically minded, halving the duration of a note adds an extra tail to the stem, doubling the duration of a note is the same as removing a tail from the stem. A note can now be indicated as being a backstick by selecting it and using shift-b to toggle the note head style between regular notation and the backstick symbol. Drum Score Editor can now be used for drummers salute or fanfare scribing. The choice was made to indicate backsticking by altering the note head rather than adding another symbol above the note to specify the backstick, as there's already too many ways to clutter the space above a note, resulting in a less legible score. As introduced in release 2.00, Drum Score Editor takes a large portion of any spare time I have, and despite the passion I have for creating and refining it, I can't ignore the mounting costs for developer licenses, signing certificates, toolsets and the like. You can help by registering at https://www.drumscore.scot and obtaining a license key in return for 15 of our British pounds. These appear on the left hand side of the workspace and allow frequently used rudiments and phrases to be dragged from scores and dropped into different lists. Each list is a new Rudiment Libraries, and can be used according to the score author's preference. For example to store phrases from similar time signature together or perhaps different tune styles. This feature maps perfectly to the rudimental style of drumming and allows very fast score composition to an author's personal style. To add a new Rudiment Library, use the View -> New Rudiment Library option. From the View menu you can also open an existing rudiment library, perhaps sent from a friend or saved on disk elsewhere, or close a library from the list open in the rudiment tool space. This has been a common request, especially for Microsoft Windows users as they don't have a native PDF creation capability, unlike the Apple Mac where it's built in. Even on the Mac though this feature saves a number of keystrokes to access the print dialogs and save as PDF. Similar to the JPG export, this feature allows the whole score to be saved as a png compressed picture, but with a transparent background. This is a useful option for creating images for websites, adding to other documents or even maybe sending to printers to have a score rendered on a t-shirt or other media! This feature allows the whole score to be saved as a scalable vector graphics file, with a solid white background. This is a useful option for producing high quality images that don't lose quality as they're scaled. This is much more useful for advanced web site images, and allows printers or others to retain the quality of the score if for example scaled to fit a larger surface. Accessed via the Format -> Staff menu, this feature clones the line that the cursor is on. It's a shortcut for inserting a line, copying all the notes and bar lines from the source line, moving to the target and pasting them. With this there's no checking to see if Edit -> Bars is on or not in order to be able to copy the whole content. This is the first workflow which analyses the content of the score to make decisions about what actions to take. It's purpose is to simplify the process of taking an ending line to a part and creating a 2nd time, where the author might want a different setting. This workflow takes care of the "admin" around doing that. If the cursor is placed on a staff line, which as a double repeat close bar marker at the end of it, and the workflow is triggered from the Format -> Music menu, it will create a 2nd time for that line, by inserting a new staff line underneath it, copying all the contents of the line down, removing any unison markings and switching the bar marker at the end of the line to one that doesn't contain repeat markers. It also adds a text tag to the first element of the repeated line saying "2nd Time" and similarly adds a text tag to mark "1st Time" on the first element of the first time line. If the the cursor is placed on a 2nd time line as created above and the workflow is triggered, it will remove the second line and the "1st Time" text tag from the line above, effectively toggling off the 2nd time line. Any changes made to the 2nd time line are lost, with the exception that like all actions in Drum Score Editor undo will put it back. When Drum Score Editor exits, it remembers the size and location of the main window, and if you docked the Rudiment Libraries and Note Toolbox on opposite sides of the screen - some people prefer that! Export as PDF now correctly renders the unison shading and other colour transparency, and aligns the scores correctly for landscape and portrait. Bar lines not sizing correctly causing them to be dropped when copying / pasting multiple selections. If a triplet or any other tied group starts or end with a rest as the first or last element, the score will note load after being saved, appearing as if it's lost the edits or sometime preventing the score file loading at all. Text cut, copy, paste not being enabled on the menus sometimes when a text areas has the keyboard focus. Text format menu not being disabled when a text area loses keyboard focus. Drum Score Editor version 2.00 is here! Instead of Drum Score Editor opening a new window for each open score, all the windows are gathered together in separate tabs. This allows a much tidier workspace for score authors. All the previous functionality is retained, including new score wizard, proportionally spaced note entry, the familiar select and action approach and a new revised text area insert capability which allows for more accurate placement. All drum score files are now expected to end in .ds, i.e. name.ds on both Microsoft Windows and Apple Mac OS X. The File->Open dialogue will only allow selection of files ending in .ds so any existing score files must be renamed. This is a one-off action, and is in preparation for .ds being registered on both Apple and Microsoft platforms as belonging to Drum Score Editor. This will allow for score files to be double-clicked from the file manager and automatically open in Drum Score Editor. Drum Score Editor takes a large proportion of any spare time I have, and despite the passion I have for creating and refining it, I can't ignore the mounting costs for developer licenses, signing certificates, toolsets and the like. You can help by wiring £15 to my paypal account, alan@whiteware.org, in return for which I'll send you a license key which unlocks the productivity features below. A website is being developed which will automate the process of acquiring a license key. These appear on the left hand side of the workspace and allow you to drag and drop your most used and favourite phrases and rudiments ready for reuse. You can open multiple Rudiment Libraries, for example to store phrases from similar time signature together or perhaps different styles - it's up to you. This feature has allowed me to write scores in a fraction of the time it took before. This has been a common request, especially for Microsoft Windows users as they don't have a native PDF creation capability, unlike the Apple Mac where it's built in. The first few features in this category are released in the licensed section, such that Drum Score Editor remembers if you decided to dock toolbars in different edges of the workspace, and also the location and size of the main workspace window. Applying the generally used convention for number of strikes through the stem of a note to indicate a roll - there's also the ability to override by using the shift-r keys to cycle through number of stems applied to any selected notes.